The raw material for BREATHAIR® is the Toyobo product PELPRENE®. There are fire retardant versions as well as black spin-dyeing versions with excellent light resistance; Toyobo can develop a version to meet multiple needs. 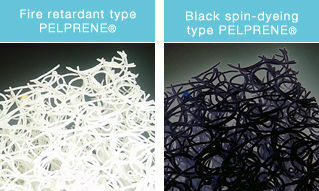 PELPRENE® is Toyobo's brand name for its polyester elastomer product with excellent thermo plasticity characteristics. PELPRENE® has the characteristics of both rubber and engineering plastics as well as being an outstanding engineering elastomer in terms of durability and processing. Furthermore, BREATHAIR® can be made from other raw materials such as polyolefins, etc. The net-like structure of polyolefins is light and transparent and so is outstanding in terms of design. Under test conditions of 70℃ for 22 hours at 50% compression as specified by JIS regulations, BREATHAIR® made from PELPRENER with a net-like structure does not exhibit any warping or distortion, however net-structure BREATHAIR® made from polyolefins does not maintain its thickness and does exhibit some distortion. A cross section of BREATHAIR® fiber shows two types: the hollow fiber type and the solid core fiber type. With the hollow type, it is possible to create a harder final product using the same weight of BREATHAIR®. In addition to raw materials and fiber cross section type, the density, thickness and the size of BREATHAIR® can also be adjusted to fit the customer's design requirements. BREATHAIR® is manufactured in flat sheet form, but the molding process can be carried out as part of post-processing.